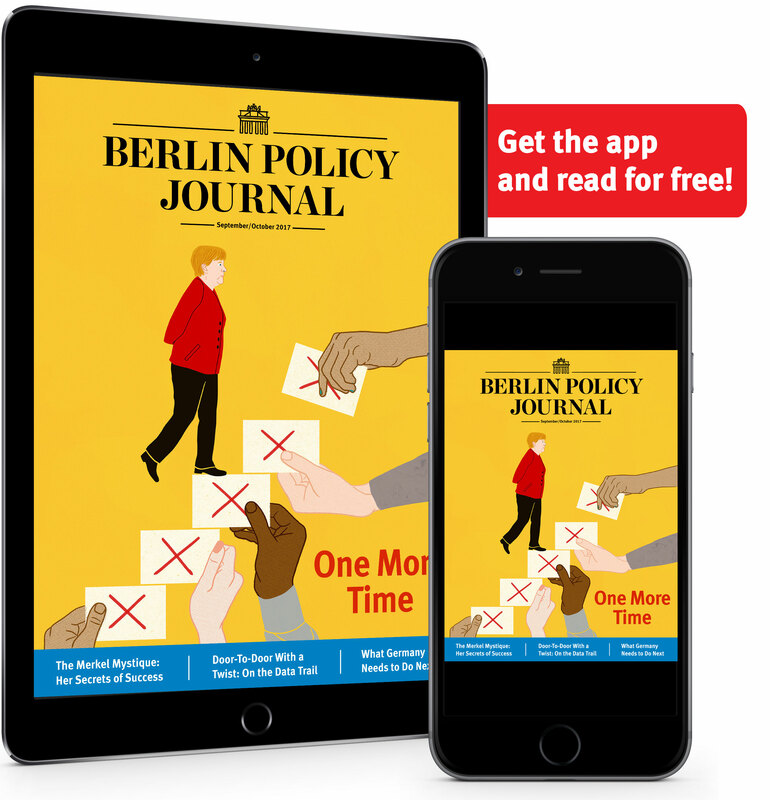 A loose cannon in the White House, the British leaving the EU, and the Bundeswehr engaged in a debate over its historical identity: German defense minister Ursula von der Leyen on how to ensure continuity and advance European security in turbulent times. At the Munich Security Conference three and a half years ago, you joined Germany’s president and foreign minister in calling for the country to take on more responsibility in the future. Given the huge changes in global security, and the fact that the liberal status quo can no longer be taken for granted, are we ready for this responsibility? You grow with the job. In hindsight, this clear expression of political will to take more responsibility was important, coming as it did in 2014, just a few weeks before the annexation of Crimea and before Mosul fell to the so-called Islamic State. But we didn’t know our resolve would be tested so soon. Despite emerging from 25 years of shrinkage, the Bundeswehr was quick to take on difficult tasks. For instance, it was the first nation to spearhead NATO’s rapid reaction force. The long-standing approach of “less and less, smaller and smaller” has left huge gaps in terms of personnel and equipment. With shrinking capabilities on the one hand, and rising global security challenges on the other, it was important to make a decisive turnaround and reverse the downward trend. Since 2014, we have increased the defense budget several times. When I took on this job in 2013, the budget was to be reduced to about 32 billion euros, but it is now set to rise to 42 billion euros by 2021. The Bundeswehr is growing again, with 18000 additional posts approved. These measures should enable us to meet the demands we are likely to face, together with our allies, using modern equipment, and with the safety of our personnel in mind. Which areas still need to catch up? A process which has been ongoing for a quarter of a century cannot be fully reversed in a matter of two or three years. That is why it is so important to ensure stable growth over the next few years, focusing on budgets, armaments, and modern personnel management methods – and following a safe, sensible strategic path. Is continuity even possible when regular changes of government are in the nature of the system? Isn’t a fundamentally different outlook required? Absolutely. It was a very painful process at first, laying all our cards on the table to ensure transparency. After some tough experiences to start with, especially with regard to equipment, we had to publicly explain to the defense committee what the problems were and what we proposed to do about them. That sparked a debate about those issues, but it was an important debate to have. The same was true of personnel management, an area in which we now know that we must invest very differently than we did before. Last year, we submitted an investment plan of 130 billion euros, and that is the bare minimum required to meet the demands we can currently foresee up to 2030. Another area to consider is modernization. We have set up a new service for the cyber domain, which also clearly requires investment. This is a highly-specialized operation, in terms of both personnel and equipment. And all of it must be coordinated with NATO and the EU. It’s one thing to spend money, quite another thing to ensure that it’s spent wisely. The defense procurement system has been heavily criticized for years now. How do you propose to make it more efficient? We have already launched far-reaching reforms under the “Armaments Agenda”. We have introduced a modern risk management program, which identifies risks before they become critical. There is now greater transparency before the general public and before parliament. We have introduced an entirely new concept of twice-yearly armaments reporting. And we have a structured dialogue with the armaments industry, in which we stress the fact that we are the customer and they are the contractor – in which we make our intentions clear in order to allow for clear planning. Our interests do not have to be the same. Contracts are now drawn up in painstaking detail, which means they now take longer to agree, and are much more specific, with costs rising to begin with. However, taken over the 10 to 15-year period covered by these contracts, the extra costs will pay off. This will prevent the nasty shock of delays suddenly leading to huge unforeseen costs, or of risks arising which must be passed onto the tax payer because things were not specified in the contract. That requires quite a big change in attitude, doesn’t it? It means the armaments industry can’t simply give the Bundeswehr whatever it has to offer, but must give it what it actually needs to meet its strategic requirements. Yes, and that change has already come about. Historically, the armaments industry has been closely interlinked with the Ministry of Defense, and for a long time a key priority was to preserve jobs in the armaments sector, whatever the cost. However, the Bundeswehr can no longer afford to subsidize jobs in the armaments industry. Instead we need high quality weapon systems at competitive prices. The armaments industry, for its part, has become freer, more European, more global; and it is being consolidated in the process. Have the policies of the new US administration given a boost to European defense? The issue of burden-sharing has been on our agenda since long before the US election. NATO’s two-percent target, which was supported by Germany and other countries in Wales, dates back to 2002. But it’s true that the lack of clarity coming from the White House on foreign and security policy matters has sped things up. The need for consensus, which I have long been campaigning for, is now clearer than ever. Regardless of our interest in a strong and reliable United States, Europe needs to solve its own problems; and to do so it must make major advances in the area of security and defense. We actually kicked off this process before the US election, and immediately after the Brexit referendum, with the German-French initiative for a European Security and Defense Union. Many people were skeptical to begin with, but that has now changed dramatically. As soon as the US election results came in, we knew it was time for us Europeans to set to work. There is talk of a new independence from the United States. It’s not so much a question of more independence, but of being better able to deal with matters of key interest to us. Capabilities developed by the European Union also benefit NATO. If we create a well-functioning logistics hub in Europe, it will benefit NATO. If we build a European drone, it will benefit NATO. If Europe increases security in Africa, it will benefit transatlantic security. In other words, we must remain transatlantic but become more European. …the president listens to a lot of people. …the president gets input from many sides. At ministerial level things couldn’t be more straightforward, but the White House is difficult for everyone to understand. If we look at cooperation under the European Security and Defense Policy, we tend to find it works in isolated pockets. How can we move from these small pockets to a proper continental defense structure? We took an important first step this year by establishing a joint civil-military command center for missions abroad, in Brussels. It was instantly effective. A number of other European Security and Defense Policy initiatives can be carried out under the Permanent Structured Cooperation scheme, or PESCO* – a term which I’m sure will soon become familiar. PESCO allows countries wishing to move forward more quickly than other countries on certain areas to join together in small groups. Examples could include: coming together to develop capabilities like the eurodrone, organizing ourselves more efficiently for the European logistics hub, creating a combined medical command, preparing for combined missions in a more focused way, establishing a competence center for training missions, or taking our first steps together into the vast new cyber domain. These are all projects we have proposed; other countries will propose other projects. Furthermore, CARD [Coordinated Annual Review on Defense] will harmonize the various planning processes, making it easier to identify capability gaps, while the European Defense Fund will facilitate investments in shared capabilities. All of these things will hopefully be launched this year, making European defense more efficient and more relevant. Many people will be sorry to see the UK leave the EU, not least because of the contribution it could have made to European defense. On the other hand, the British have tended to put the brakes on any steps which they thought might lead to a European army. Will Brexit make our lives easier in terms of security and defense? It’s true, the UK has consistently blocked everything in this area, but a European army was never the issue. The fact is, nobody really wants one. But the British even blocked the harmless European Medical Command because it contained the word “European”. Their negative positioning will now work to our advantage: since defense and security is the one area in which nothing much has grown together in Europe, there will be very little for us to pick apart. However, we still want a good, strong, solid relationship with the UK under NATO. And we will continue to maintain that relationship. Whether the UK will be invited to take part in European security projects in future – and if so in what role – remains to be seen. In our mutual interest, I would like to see Europe retain access to London’s security and defense expertise. If you ask Europeans in which areas they would like to see “more Europe”, they say security. 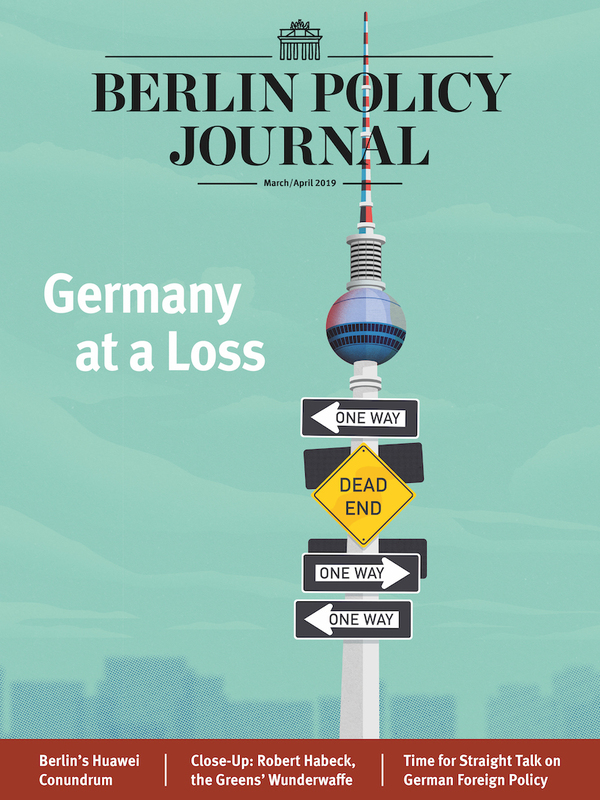 In Germany in particular, people are proud of Europe’s soft power but have a problem with the idea that hard power is also required to maintain peace. We have many peace research institutes, but no national debate on civil-military issues. Isn’t it time for people to change the way they think? Our reluctance to have that debate is, of course, partly due to Germany’s difficult past. However, in recent years I have noticed new angles opening in the discourse, especially since the fight against ISIL and as a result of the refugee crisis. There is now talk of whether our history makes it all the more incumbent upon us to be more proactive on security and defense. A country of Germany’s political and economic stature cannot simply look the other way during a genocide, which the Yazidis almost suffered at the hands of ISIL in 2014. It was then, for the first time since World War II, that we delivered weapons to an area of crisis and conflict. However, we acted within a partnership, under a comprehensive approach, and people felt that was important. We know that nothing short of military measures will have any impact on ISIL: they don’t negotiate, they decapitate. But we also know that as soon as ISIL is defeated militarily, the work of stabilization begins: building the economy, fostering reconciliation between different groups, good governance and political stability. These are two sides of the same coin. 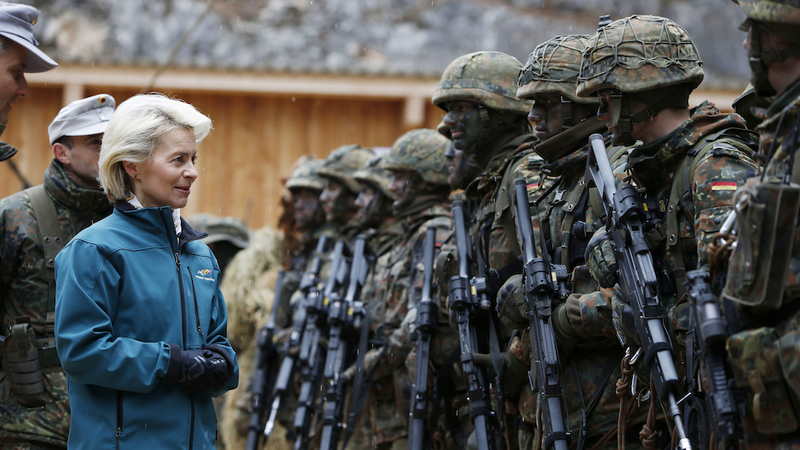 But there’s still the question of how the Bundeswehr can find its place within German society. You once quoted former German president Walter Scheel, who in the 1970s said that (West) German society quietly acknowledged the existence of the Bundeswehr but still had not accepted it. The Bundeswehr now has a completely new set of tasks, and it has carried them out successfully. But its efforts still don’t resonate with German society at large. Yes, but there’s an important distinction to be made here. First of all, people in Germany think their security is in good hands with the Bundeswehr. That’s quite an endorsement of our military personnel. At the same time there is a prevailing sense of caution when it comes to deploying them on operations. And that’s as it should be. But we urgently need a much wider public debate. That might sound like a platitude, but amid the current debate about the influence of the Wehrmacht on the tradition and identity the Bundeswehr, I am always struck by the fact that the Bundeswehr has 61 proud years of history, but has never had a narrative of its own. And yet it has quite a story to tell: the story of a German armed force emerging from the shadows of world war and the holocaust, a force which would soon become renowned among our neighbors and allies, always acting in the service of democracy, human dignity, and freedom. It is also a story of transition from the division of the Cold War to the “Army of Unity” [when the Bundeswehr integrated the former East German army]; then came the first operations abroad, and of course the high international esteem in which the Bundeswehr is held. These are stories we need to tell. We should shine a light on those who were part of it: the fallen and wounded, of course, but the successes should also be honored; because all of these things are part of our tradition and identity. The White Paper process was important because it involved so many contributors. But ultimately it remained a topic for a relatively small foreign policy community. If we are serious about finding a narrative for the Bundeswehr through discourse, shouldn’t we be taking that discourse to an even wider community? We should. And that’s also true of other topics affecting the Bundeswehr. We can’t just say, “We need to be more appreciated by society”. Instead we must have a conversation with as broad a section of society as possible – a conversation about our history, what we do, and why we do it. Here in Berlin, we have launched a brigadiers’ workshop to identify key topics from 61 years of Bundeswehr history. But we also go out to regional locations, where we invite local communities (the church, administrative associations, even NGOs) to talk about such topics with Bundeswehr personnel directly. We don’t just have civilians in uniform, we also have soldiers in plain clothes. But we have to accept that not every soldier who says something in public is completely representative of the Bundeswehr; rather, the Bundeswehr has a wide range of personnel, with an even wider range of opinions. But what do you say to those who accuse you of iconoclasm, who say it’s basically all about renaming barracks? One only has to think of the controversy that broke out over whether it was acceptable to take down a picture of Helmut Schmidt dressed in Wehrmacht uniform, and if so, what could be hung in its place. Why not show Helmut Schmidt dressed in his Bundeswehr uniform? He wore one of those, too. These are just the kinds of issues we need to debate. Metaphorically speaking, plain white walls have been left where the Wehrmacht pictures once hung. And the Bundeswehr must use those spaces to proudly portray its own 61-year history. * The term PESCO stands for “Permanent Structured Cooperation”, which is part of the EU’s Common Security and Defense Policy. This instrument was introduced under the Lisbon Treaty in 2009 to give interested member states the option of intensifying their military cooperation. The aim is to expand Europe’s defense capabilities and bring more coherence to its security policy. It is up to individual member states to set the pace and choose the defense areas they wish to develop.